One of the first things I wanted to do upon arriving home to Chicago was find some asparagus. I love asparagus utterly, and could probably eat it until I turn into an asparagus spear. Luckily for me, asparagus season isn’t that long. “Asparagus season isn’t that long” was actually my biggest fear upon arriving home too. I was terrified that three weeks gone from home, and a couple weeks of not shopping prior to that meant I’d missed out completely. Which would have made me quite sad. So, of course, it only makes utter sense that we would get in about 8:00 pm on a Friday, and I’d be prepared to go to a Saturday morning farmers’ market. Where, thankfully, I found asparagus. I also found a couple of tomato plants, an amazing tamale (that isn’t New Mexican style at all), and some eggs. My plan, upon finding I really did have a shot at some asparagus, was risotto. Mostly because my brain has been on a risotto and tamale kick recently. So far, like beer and cheesecake1, I have not put them together. Further akin to beer and cheesecake, I suspect consuming them together is a poor idea, but I simply cannot promise I won’t. 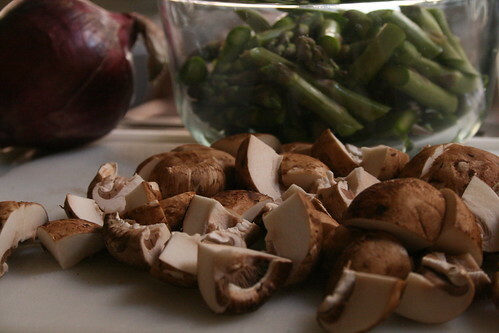 Anyway, I decided to make an asparagus & mushroom risotto for dinner last night. I also decided to wing it, with some guidance. My guidance came from “How to Pick a Peach” by Russ Parsons. 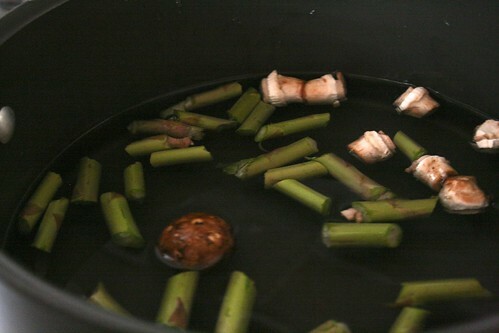 I followed Parsons’ recommendation to make a simple broth by boiling the woody asparagus ends in the water for about 30 minutes (only he says simmer, but I boiled anyway). I also threw in the mushroom stems, because what the hell? I washed dishes during the first 20 minutes of boiling. Then I started everything else by pouring way more olive oil into the “everyday pan”:http://www.amazon.com/Calphalon-D1382PB-Commercial-Hard-Anodized-Everyday/dp/B00006FX83/ref=sr_1_10?ie=UTF8&qid=1306261948&sr=8-10 than I meant to. I’d guess about 2 tbsp. I put this over medium-high heat, then got distracted chatting with Bill about when he’d leave work. Once the pan was overly hot, but not smoking (amazingly), I dumped in the mushrooms and onions. Following what I thought was Parson’s advice, I cooked them to almost done, but not quite. I definitely browned the onions (which he distinctly tells you not to do, I discovered later.) I regretted not cooking the mushrooms a few minutes before adding the onions. As the onions were considering becoming brown, I threw in the asparagus cuts and cooked them too. My goal was to get them a very bright and pretty green, but not be able to smell them at all. In other words, start the cooking process, but not too much. Once I got to that stage (bright green, no veggie smell yet) I took everything out of the pan & set it aside. I heated the pan back up, then dumped in a more reasonable amount (~1 tbsp) of olive oil. I’d’ve used butter, but mine smelled funny after our long trip. (Note: the stuff in the freezer was fine, just not the fridge.) I toasted the rice until they looked translucent on the outside & edges. Then, in violation of everything I’ve ever read about making risotto, I dumped in the full 1 c of wine. Yes, I did. I stirred it in and stirred for a bit. Then I got distracted and went and looked in “How to Pick a Peach” at the “Making Risotto” section (it’s effectively in the asparagus section). While, overall, he implies that stirring is (generally) not all it’s cracked up to be, he says that the first liquid addition should just be a little wine, and you should stir it pretty good. After the wine addition, you don’t have to stir as much when adding the liquid. Oh well. At the third addition of broth, I threw in some salt. More than I felt was right, which is a good barometer for me, as I always under salt. At the fourth addition of broth, I tossed in the veggies. Fifth, more salt. Sixth, hoped I wasn’t overcooking the asparagus. The sixth was the last one. I was going to call it done, but I remembered Parsons making some comment about risotto needing some French word at the end I didn’t understand. I read it some more and decided it basically meant “fat”, so I grated in the 2tbsp of Manchego cheese. Bill walked in the door at this point. I stirred it in, served it up, and we ate it. I worried a great deal about overcooking the asparagus. Overcooked asparagus is basically vile. And, at one point, I thought I caught a whiff of overcooked asparagus, which caused me to despair, as my rice was really not yet done. I bore up, and decided the worst that could happen was it’d be inedible, we’d throw it out, I’d have a good cry, and Bill would bring GrubHub to the rescue. However, I was wrong. It was good. Surprisingly good, really. Amazingly light, which is the opposite of I expect out of a risotto. That was a nice surprise, though I might have liked it to be a touch heavier in texture & mouthfeel. 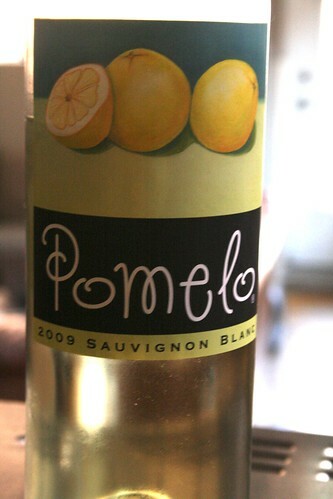 As I mentioned above, I chose the Pomelo wine because it’s very citrusy. It’s actually also extremely light (one of the lightest Sauv Blancs I’ve ever had), but it’s astoundingly citrus on the nose & tongue. I thought it might be nice to use because lemon goes so nicely with asparagus. I understand that “citrus” doesn’t mean “lemon”, but I figured it was worth a shot. It didn’t come out as strongly citrus-flavored as I might have liked, but it was there. I think it contributed a great deal to the light but distinct flavor of the rice. I should have added a great deal more cheese, and I possibly should have grated some to sprinkle on top. The cheese flavor didn’t come out in the slightest. Parsons discusses how cheese/fat/whatever that french word was helps with mouthfeel and thickening and taste. I’m rather unclear if it did any of those things. If not, then I added calories for no good reason, and that’s never worth it. Maybe I’ll try again at some point with no cheese & see what I get. The mushrooms, weirdly, were by far the tastiest piece of this risotto. Something about the citrus of the wine, the green of the asparagus and the earthiness they had combined into a tiny bite of fabulous every time you got a mushroom chunk. So don’t leave those out. So, that’s my latest experiment in the kitchen. Sometimes “throwing it all together” is less daunting than others, and this will certainly help with the bravery in throwing something together (since it worked). fn1. “The Meatyballs Mobile”:http://meatyballsmobile.com/ started following me via Twitter awhile back, which is how I discovered them. I followed them back, and had a delicious meatball sandwich the next day. I was the first person at the truck, so I had a moment to talk to the driver. Who may or may not have been Phillip Foss, the chef behind the truck. I told him I was Bill’s company’s “beer & cheesecake” contractor when he asked what I do. He asked if I’d ever combined them, and I said I never had, because it had never occurred to me, but now I might. We both thought about it for a minute, then I as I started to leave, he advised me not to. He didn’t think it’d be a good combination. I think he’s probably right, but I might have to try it anyway.